Founded by Keith Large in 1986, All Green, Inc. is an example of dedication to servicing customers with their landscape management and winter services. All Green is one of the largest local landscape companies in northwest Ohio. From 1986 to present, Large envisioned a company that could provide service to the customers in a professional, yet personal way. The team at All Green takes pride in the relationships with its customers and strives to continue delivering “personal service” with your changing needs. The ability to service a wide range of customer needs is evident in our customer base. 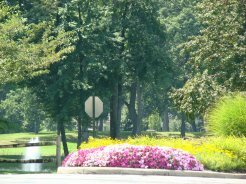 We currently manage landscape and winter services for hospital and collage campuses, over 1,000 privately owned townhouses, villas and condominiums, commercial real estate, distribution centers and world headquarters. Being locally owned, we employ 30-40 people in landscape season and over 65 people for winter services. Our trained staff and workforce are in full uniform and go through an annual safety training program. We also support our community through donating our time and resources to local charitable organizations.